Great price, supermarkets charge much more than Amazon's usual price of £7.25. I have been using this detergent for some time now having an allergy to general washing liquids, since using this I've not had an issue. The price is an Add on item so £20 spend is required however if you stock up on 6 of these for £21 its a great deal! 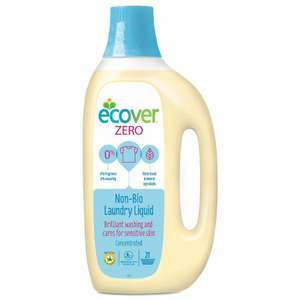 Ecover zero laundry liquid is a fragrance free laundry detergent that works on your clothes and is kind to your skin. It is perfect for sensitive skin and approved by allergy UK. It has no nasties, gentle plant based and mineral ingredients and also suitable for septic tanks. It is approved by Allergy UK and is leaping Bunny certified, never tested on animals. Usage: Add to your machine's dispenser. Run your machine following the manufacturer's instructions. Caution: Keep out of the reach of children. The suitability of our Laundry Liquid for people with serious skin conditions cannot be guaranteed. If you suffer with unusually sensitive skin, please contact your doctor for advice. Produced for: EPC N.V., Industrieweg 3, B-2390 Malle.